Other Specialty CME Credits: Included as part of the 4 hours, this CME activity is eligible for 4 hours of Safe Injection Practices credit, subject to your state and institution requirements. Vascular access is a potentially life-saving procedure that is a mainstay of emergency medicine practice. There are a number of challenges associated with obtaining and maintaining vascular access, and the choice of the route of access and equipment used will depend on patient- and provider-specific factors. 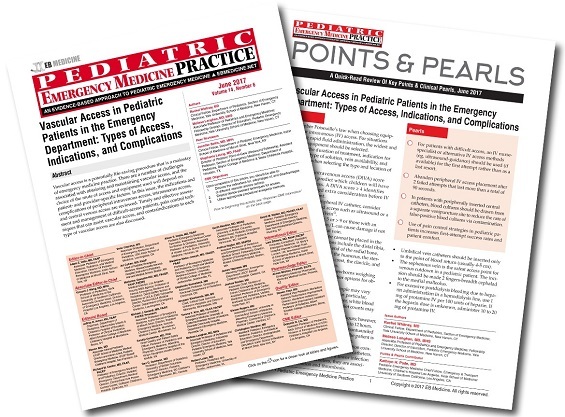 In this issue, the indications and complications of peripheral intravenous access, intraosseous access, and central venous access are reviewed. 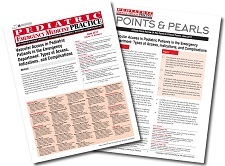 Timely and effective assessment and management of difficult-access patients, pain control techniques that can assist vascular access, and contraindications to each type of vascular access are also discussed. A 9-day-old girl who was born in Mexico and just moved to the United States is brought to the ED with vomiting and lethargy that have been increasing for the past 3 days. Her mother is no longer able to wake the baby. The baby is afebrile and unresponsive to voice. She has cool, mottled extremities with a capillary refill time of 5 seconds. Her heart rate is 180 beats/min and her systolic blood pressure is reported as 60 mm Hg by palpation. The nurses have been unsuccessful in obtaining access after multiple attempts. The resident who is working with you asks if an intraosseous needle can be placed in a 9-day-old baby. If so, can blood samples for laboratory tests be obtained from the site? Are there medications that are contraindicated through an intraosseous line? This is a great article on a subject that one really takes for granted. I will be more careful with my peripheral infusion considerations as solutions with an osmolarity greater than 600 mOSM/per liter can cause significant tissue damage. I was unaware of this, particularly with calcium chloride and D50; I also became aware of the use of lidocaine prior to the infusion of IV volume fluids through the bone marrow space.